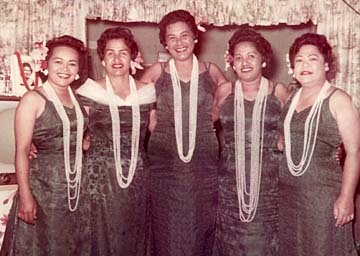 The original musicians at the Waikiki Sands are, from left, Leinaala Cypriano, Genoa Keawe, Lovey Lui, Annie Hu and Agnes Ah See. All but Keawe are deceased. Ever the trouper, Auntie Genoa Keawe's presentation of "A Night in Old Waikiki" will go on tonight in spite of one of her star performers having to bow out earlier this week due to hospitalization. Auntie Violet Alfapada will unfortunately not be at tonight's show, which brings together many of the performers with whom Keawe has shared a stage. Keawe's son Eric said that while Alfapada's reputation never hit the mainstream through recordings, "Auntie is thought of as the musician's musician," and still very popular in Leeward Oahu, where she and her family band have a regular weekend gig at the NCO club in Waianae. Genoa Keawe worked side-by-side with Alfapada at the Kapahulu Tavern in the '50s and '60s on Kapahulu Avenue, where Keo's used to be (now Starbucks/Jamba Juice), playing with Billy Gonsalves. Even though Alfapada now performs while in a wheelchair due to arthritis, she's still such an appealing entertainer that she was scheduled to open "A Night in Old Waikiki." 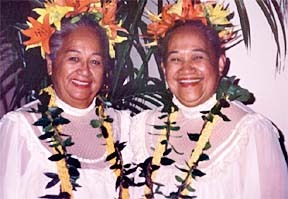 Dancers Auntie Mapu and Auntie Flo, who will perform during "A Night in Old Waikiki." In her place, another one of Keawe's sons, Gary Aiko (a former member of one of Don Ho's bands), will perform during a reunion of dancers from the Waikiki Sands. The restaurant was located where the Waikiki Beach Center now stands at Kalakaua Avenue and Kanekapolei Street, and in its heyday, Eric Keawe said that "the hula dancers were part of a full-on Polynesian show, where they were featured, along with my mom, with the late Leinaala Cypriano (singer Nohelani's mother)." Genoa Keawe said that even though the dancers -- which will include Novena Naylor Wong and the three Joshua sisters, Blossom, Lorraine and Gladys -- are looking more matronly these days, "they're still so rascal!" and will dance to songs like the ol' chestnut "Beyond the Reef." Genoa said other old-timers that will be part of tonight's show will be singer Kelii Chun (known for her song "Ahulili") and "the Hauoli Girls," Iwalani and Mapuana (a k a Aunties Flo and Mapu), dancers who were associated with the late Auntie Pauline Kekauhuna. In spite of having worked seven days a week, from 9 p.m. to 2 a.m., Keawe looks back on those times with fondness. When asked whether the long hours -- which continue with her popular Thursday night gigs at the Waikiki Beach Marriott Hotel -- made her a better performer, she laughed, saying, "I've been the same person and singer since the very beginning, and my voice is still strong!"